Dr Barry Morgan was born in 1947 in Neath, South Wales. He was educated at University College, London and Selwyn College Cambridge and trained for ordained ministry at Westcott House, Cambridge. In 1986, he was awarded a Ph.D. from the University of Wales. 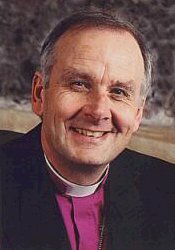 In April 2003 he was elected Archbishop of Wales, following the translation of Rowan Williams to the see of Canterbury. Following ordination as a deacon in 1972 and priest in 1973, Barry worked as a curate in the parish of St Andrews Major, Michaelston-le-Pit, before moving to become Chaplain and Lecturer at St Michael's College and the University of Wales Cardiff. Subsequent appointments include: Warden of Church Hostel Bangor; Chaplain and Lecturer in Theology, at the University of Wales Bangor; Director of Ordinands and In-service training advisor in the diocese of Bangor; and Rector of Wrexham. In 1986, he was appointed Archdeacon of Meirionnydd and Rector of Criccieth with Treflys. He was elected and consecrated Bishop of Bangor in 1993 and in 1999 was elected Bishop of Llandaff. In 2003 he was elected Archbishop of Wales. Barry and Hilary married in 1969 and have two grown up children, Jonathan and Lucy. Hilary works in Cardiff as a Solicitor. Barry has served on a number of commissions and working parties and currently represents the Church in Wales on the World Council of Churches. He has published several books and is currently working on the poetry of R S Thomas. Peace Mala makes a significant contribution to the promotion of peace and respect for others in our world. It is to be commended for its guidance of young people as they confront bullying, intolerance, injustice and prejudice of all kinds. Since education is an important element in creating a more compassionate society, the central tenet of 'Treating others as you would like them to treat you' is one from which we all benefit. I am pleased to endorse and support Peace Mala and the work of everyone involved. It is vital that we take every opportunity that we have to work for the promotion of peace and respect in the world. Increased awareness, tolerance and respect between communities are vital elements in achieving this, and you are to be commended on your contribution to this vital process. I wish you every success in your work as you contribute to the vision of peace, hope and healing.